As a Realtor, I really believe in Habitat for Humanity. I've built homes, signed petitions and helped financially. I've seen first hand the difference they make. Every family deserves a place to call home. These families are not asking for a hand out, they're asking for a helping hand. Please sign the petition below so the government will continue to support building homes for families in need! To volunteer in your community, use our search engine to find the Habitat for Humanity near you and find out about their volunteer opportunities. Habitat for Humanity projects and volunteer opportunities for youth ages 5 to 25, their teachers and youth group leaders. Learn construction skills while building homes alongside other women. 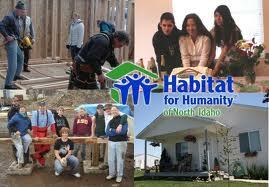 Combine the fun of recreational vehicle travel with a fulfilling Habitat for Humanity volunteer experience! Revitalize neighborhoods and serve homeowners by maintaining the exterior of Habitat homes. Help build decent, affordable housing around the world on a short-term volunteer trip. Make a difference in the world! Spend 6 to 12 months volunteering in Habitat offices overseas. Commit to a long-term volunteer program. Experience the place where Habitat for Humanity was started! Volunteer your skills for 2 to 6 months at our international headquarters in Americus, Georgia. Service-minded individuals ages 18 and older live at and work with local Habitat affiliates while earning living allowances and receiving an education award upon completion of service. Donate to Habitat for Humanity and put your faith into action. Shelter from rain, wind and sun is a basic human need. Habitat for Humanity provides decent, affordable houses to families in need. Habitat homeowners gain self-respect as they work alongside volunteers to construct their homes. 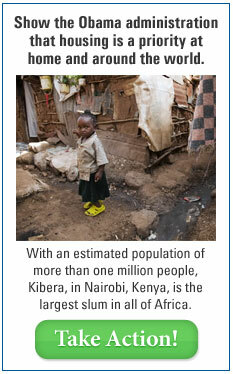 Since 1976, our ministry has built or repaired over 400,000 houses worldwide for more than 2 million people. Please make a donation today using our secure online donation form. We partner with as many families as possible, but the problem of inadequate housing has reached critical proportions globally. Your donation helps to build affordable housing for families in need, providing them with shelter and the hope of a better life. Do you have a minute to help make sure the Obama administration hears our message? Last week, our CEO, Jonathan Reckford, wrote to the Obama administration about an important issue—improving the lives of people living in slums throughout the world. I hope you can take a moment to reinforce his critical message. By the year 2030, we expect that as many as 2 billion people worldwide will be living in slums, facing overcrowding, unsafe housing, unsanitary conditions and limited access to safe water. Without real housing solutions for people in the poorest countries, other efforts at development are destined to fail—efforts to improve public health, education and disaster recovery don’t succeed unless people live in safe and healthy homes. President Obama recently highlighted the importance of leadership in changing the lives of people living in slums. Habitat for Humanity wants him to know that we are ready to work with him to improve the lives of slum-dwellers globally. From passing critical legislation to increasing cooperation between agencies and throughout the international community, Habitat will play a key role in enacting strategies that work in an ever-urbanizing world.Please take a moment to add your voice. In just a few minutes, you can reach out to the White House to make sure they know you support Habitat’s work to find real housing solutions for people in need.